According to astrology negative effect of mars can hamper the marital life. When an inauspicious mars influence the kundali the person becomes manglik. Marriage of manglik person with a non manglik person is considered as ill fated However if one manglik marries other manglik the mangal dosha in horoscope gets cancelled and the couple can lead a blissful family life together. With increasing number of love marriages happening these days the tradition of kundli matching has taken back stage. 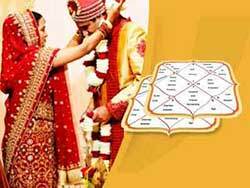 Under such circumstances if a non manglik unknowingly marries a manglik person, one need not be worried because horoscope match can definitely suggest alternative remedies to overcome the predictable barriers in couples conjugal path. In order to follow the path of righteousness, a stable married life is very important. One should not be confused while taking right decision before marriage. Horoscope matching in vedic astrology also depends on nakshatra compatibility which comes under study of lunar constellation of moon sign. Kundali matching in vedic astrology is interpreted on the foundation of sun sign, moon sign, janam nakshatra and placement of all planets in various houses of natal charts. Many a times we have seen two people get along well naturally and some don’t. Astrology says the process of getting along well is without any effort is excellent compatibility. The highest compatibility matching score in astrology is 36 points. Any compatibility point below eighteen out of thirty-six is not considered good. Therefore, marriage is not advisable under such circumstances. The report calculates couples each individual birth chat with compatibility to explore out the strength of their romantic and platonic relationship.